Brew Masters Season 1 DVD Review For a series about beer, Brew Masters does just about everything you expect and want it to do: it introduces you to the characters who have made brewing beer an art form, it informs you and it makes your mouth water. Many of us who enjoy a cold glass of amber liquid have, at some point in our lives, fantasized about what it would be like to work in a brewery. Imagine a job where you share in the profits, so that every time a batch goes wrong it’s not just the boss’ money being poured down the drain, it’s yours. A job where you take home a carton along with your pay check. Where you knock off early on Fridays to sample the week’s brew and play games. For most of us these things remain a dream. For the folks at Dogfish Head brewery, Delaware USA, it’s what they do. 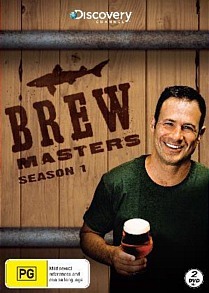 Brew Masters, season 1 is a six-part documentary from the discovery channel. It follows the exploits of Sam Calagione, founder and boss of Dogfish brewery, as he travels the world in search of exotic ingredients and forgotten recipes for beer. In each episode we see at least one new beer created. The cameras take us through the whole process, from inception to brewing to the final result. The show is carefree and fun in its presentation, with Sam himself providing the narration. It‘s also surprisingly informative, in an easygoing kind of way. You’ll learn all sorts of things about yeast without even realising it, and various beer-related facts and narratives are scattered throughout the show by ‘Beerology’ snippets. But the most interesting aspect by far is the extraordinary way that Dogfish look outside the box for their next best-selling beer. The company motto is ‘Off-centred ales for off-centred people,’ and this mindset is personified by Sam and his ’try anything, rule out nothing’ approach. Would you have ever thought of drinking a beer fermented from chewed corn, whose main active ingredient is human saliva? What about a beer infused with the cedar wood off-cuts from a hand made surfboard? Or perhaps you’d like to try the long-lost beer of the pharaohs, which uses wild yeast captured in the shadow of the great pyramids? Everything about Dogfish seems to be about risk and adventure. Sometimes taking that risk means they’ll have an award winning beer at the next big food and drink festival. Sometimes it means pouring thousands of dollars down the drain. While the show is entertaining as a whole, some bumps start to appear around episode 4. Something goes horribly wrong with the editing here: Scenes are disjointed, narration is cut off halfway through and we jump from one place to another with no warning. And episode 6 has an unfinished feel to it- probably as a result of real world events which were meant to but didn’t quite sync with the filming of the show. Unfortunately this may be the first and last time we see the folks from Dogfish on our television screens, because the show was not slated for return on the Discovery channel. This is a bit of a shame, because there is a lot to like about the show’s presentation and content, and if given the chance it could have grown into something truly worthwhile. For a series about beer, Brew Masters does just about everything you expect and want it to do: it introduces you to the characters who have made brewing beer an art form, it informs you and it makes your mouth water. Now all we need is taste-o-vision, and the experience would be complete.